Tonight: Mild! Clouds thicken. Patchy fog. Low 50s. Tomorrow: Peeks of sun. Afternoon showers. Low/mid 60s. Sunday: Mostly sunny, windy and cooler. Upper 40s. After yet another record-shattering warm day for most locations, including Boston that soared to 72°, shattering the old record set back in 1985, both the daily record and setting the all-time warmest February day, we are in for yet another mild day tomorrow before we slide to much more seasonable temperatures by Sunday. Tonight, temperatures will remain on the mild side with overnight lows ranging from the 30s to 40s north, to near 50 south. A few showers cannot be ruled out overnight with patchy fog developing and extending through the morning hours. 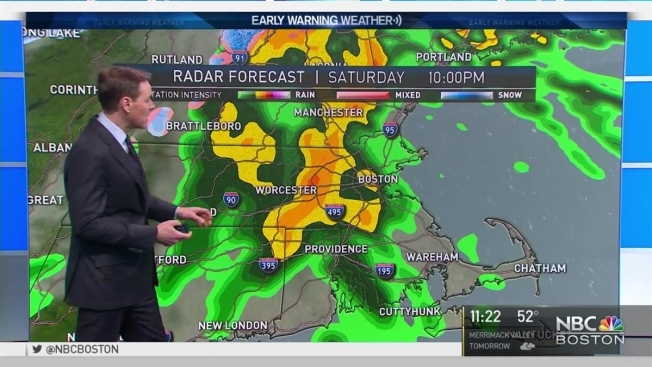 Saturday brings high temperatures into the lower 60s with more rain on the way for the afternoon and evening with the heaviest rain moving in after dinnertime for western New England. This line will spread from west to east throughout the rest of the evening along a cold front that will usher in colder air for the second half of the weekend. With the quick warm-up along with the forecasted heavy rain at times, a flood watch has been issued for the northern half of New England as the snow melts and possible ice jams could create some flooding. By Sunday, blustery NW winds and cooler, more seasonable temperatures move in. Along the Green Mountains in northern Vermont and higher elevations of northern New Hampshire, a few inches of snow is possible on the back edge of the system Saturday night into Sunday morning. The possibility exists for some back-end snow showers as far south as the Berkshires and Worcester Hills where cold air is on the heels of precipitation. Temperatures only reach into the 40s on Sunday with dry and sunny skies overhead. Milder air will be moving up from the south on Monday as high pressure offshore turns the flow to a more southerly direction. Gusty winds will continue with mostly sunny skies with highs ranging from near 50 across the south to the mid to upper 30s across the north. High temperatures again crest into the low 50s across the south on Tuesday. Expecting mostly cloudy skies with a chance of rain showers throughout the day as a cold front approaches from the Great Lakes. We will be keeping an eye on the potential for more rain going into the middle portion of the work week. More details on the exclusive Early Warning Weather 10-day forecast on necn and NBC Boston.